Having moved from Xiamen to Singapore, this humble looking eatery had been serving its customers since 1928. 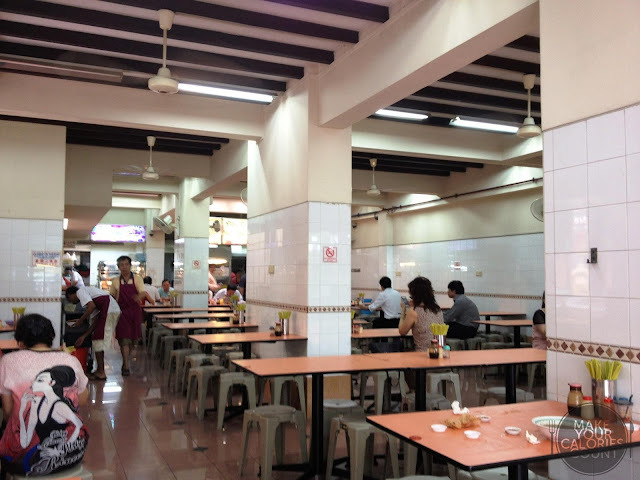 This has been a place that I visit since young, probably due to the influence of my parents who are regular patrons and swear by the jumbo wild tiger prawns which seemingly nowhere else in Singapore seems to serve! My mum would even jokingly remarked 'dua chiak, ho chiak!' which in Hokkien meant big and tasty! 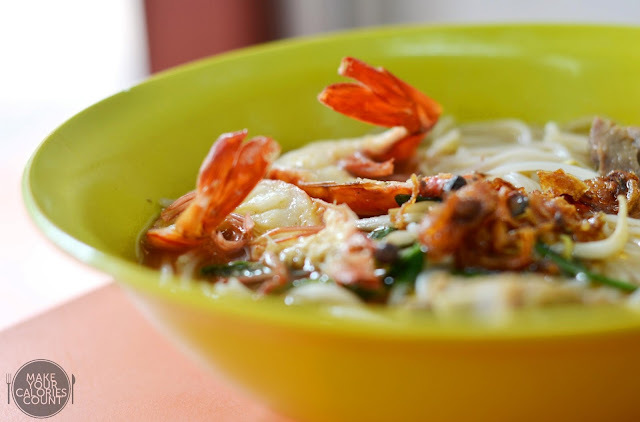 The traditional rendition of prawn noodles from Xiamen is the classic version that is soup-based. However due to the need to cater to the needs of their Tibetan customers back then, the dry version was created, which reminded them of home. 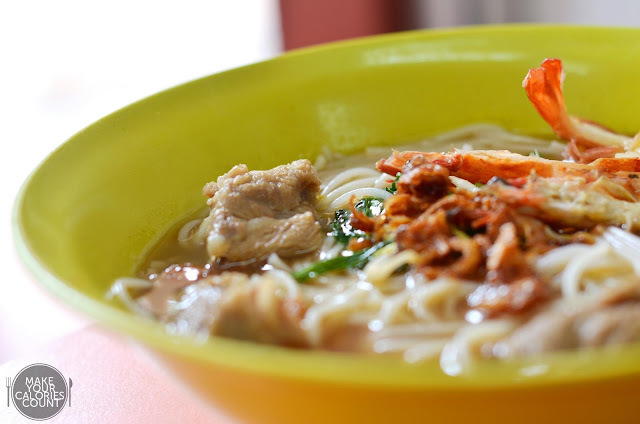 The latter version where dry chilli powder was added to the noodles was improvised with demand from Penang customers. 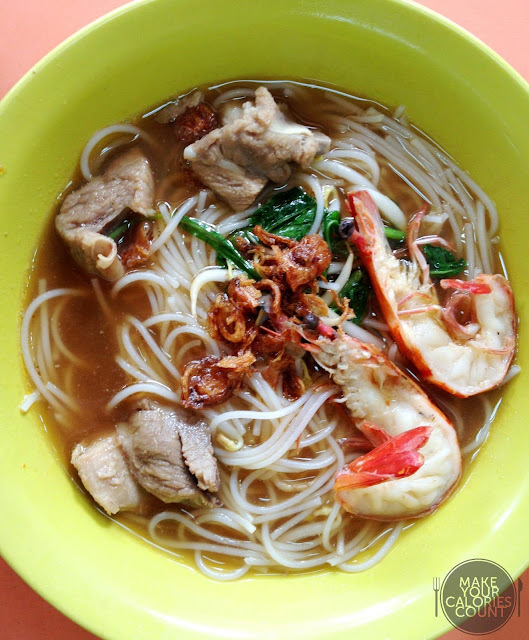 Apparently, adding on chilli powder atop the broth is the Penang-style and one where its legacy continues! For some reason, ngor hiang (sausage-esque roll filled with minced pork and prawn seasoned with 5 spices powder) had been a partnering appetizer to the prawn noodles here and seemed almost like a tradition to order it together with some classic guang chiang (pink pork sausage), crispy prawn crackers and yam fritters while waiting for the prawn noodles to be served. On this occasion, cursed with a small appetite, we decided to give this a miss and go straight to the mains! At S$8, this was the smallest portion for the jumbo prawns category. 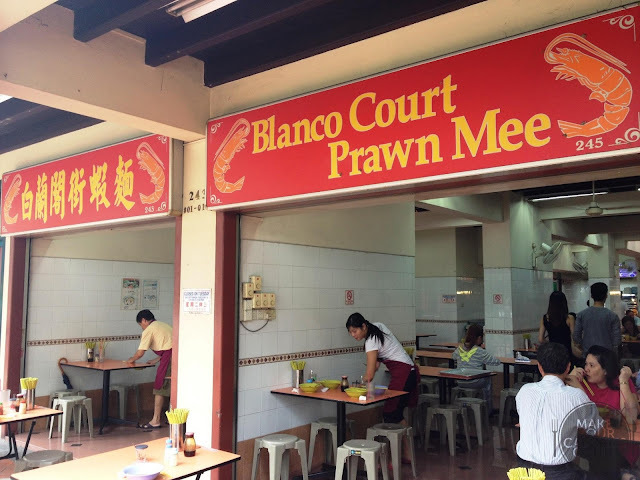 For the normal smaller prawns, they would come at half the price for S$4. The jumbo prawns mostly came with prawn roe in each of them, so for the cholesterol conscious - beware! We are not exactly fans of prawn roe but the prawns were fresh and distinctly wild caught. 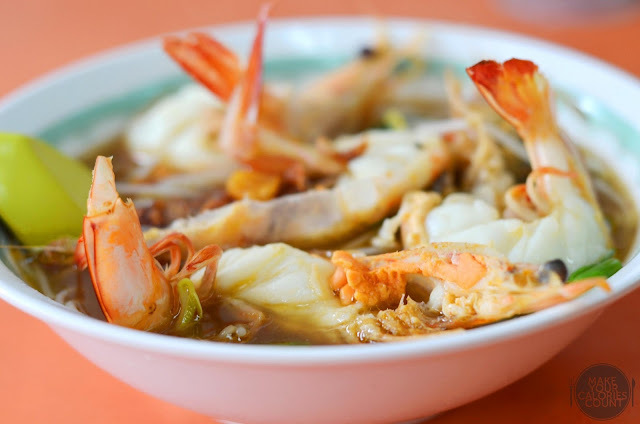 The main difference is that burst of freshness in sea prawns which would not have that slightly stale taste like its freshwater counterparts. The prawns were thoughtfully sliced into halves for the lazy diners who would not have to get their hands dirty and messy with the de-shelling. The flesh of the prawns was succulent and bouncy. Topped with fried shallot and lard pieces, it gave an added layer of crispy crunchy texture to the soft al dente thick mee hoon (rice vermicelli) and that beautiful fragrance. While the greens were lacking in the bowl, it was compensated by the unami flavours of the broth, which had an initial taste of savouriness but concluded with a tinge of sweetness at the back of throat upon savouring. 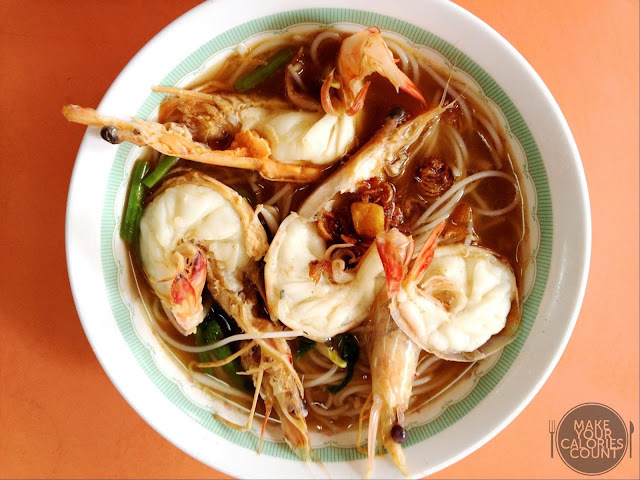 It might disappoint some if you are looking for a really strong oomph of the prawn flavours in the broth but do not get me wrong, it was pleasing to our palate, but just a heads up if you were looking for a more intense flavour. While the flavours of the dish and the freshness of the ingredients were spot-on, we felt that it was slightly overpriced at S$8 because what you are really getting is just two jumbo prawns. The savoury brown broth was equally addictive in this version. Like the all-prawns-only noodles, they were sliced into half but that being said, you are essentially only getting 1 prawn and a few diced portions of the pork ribs. The ribs were beautifully chosen for their cut, with just the right amount of fat to complement the lean portions, giving it a succulent bite with its fresh meaty flavours exploding with juices inside your mouth. Likewise, the fried shallots gave the much desired texture and fragrance to the luscious bowl. Those who desire an extra punch of heat can pile on the chilli powder available at each table. On that note, if you are guilty of savouring the noodles with its broth in entirety, feel free to request for more broth at the counter and they would be more than happy to fill you up! 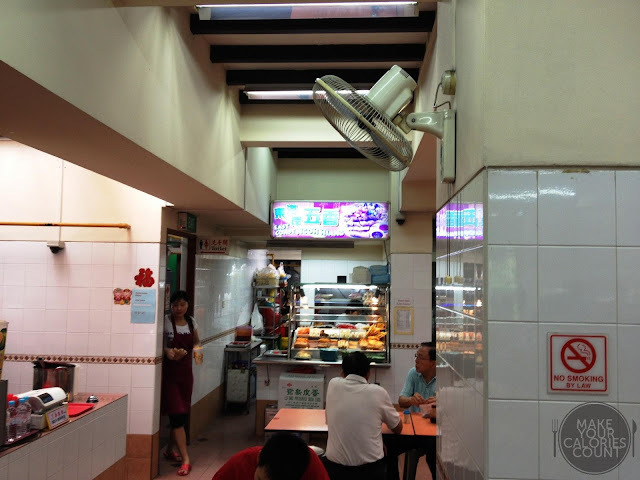 You will have to place your orders in person at the counter, but no cash will be taken then. Upon taking your orders (with or without drinks), you will be issued an order chit. 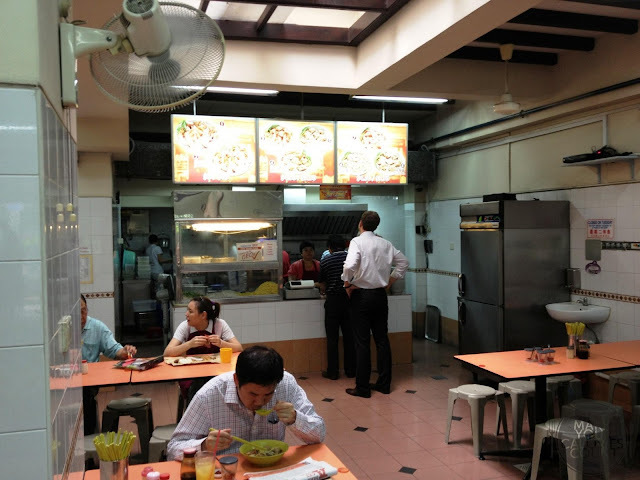 The ngor hiang stall adjacent to the main prawn noodle stall. With the order chit, you will then need to come over to this drinks and payment counter (left hand side of the above picture). It is only here where only cash would be accepted. You could also order your drinks at the counter directly, but typically regular patrons would go for their homemade lime juice. A good quench for the constantly hot weather and a good refreshing tang to add to your savoury noodles! The ordered dishes however would be served to your table. If you are planning a visit, do note that they only serve the morning and lunch crowd as they are closed at 4pm. It would be advisable to come slightly earlier but avoid the lunch crowd. It is open for business from 7.15am onwards and closes on Tuesdays. One thing which we would complain about is that it could do with some air-conditioning! Otherwise, this is an eatery which my family had been patrons for decades and would certainly continue to be, well unless its standards take a plunge of course!